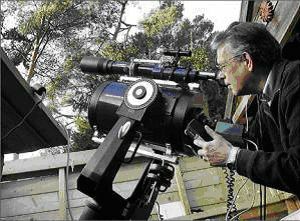 On Wednesday 4 January I was saddened to receive the news of the death of amateur astro-imager Jan Timmermans. Jan was an active member of several online groups and in the amateur astronomy community. I first came into contact with him in 2004 via the QCUIAG (QuickCam and Unconventional Imaging Astronomy Group) on Yahoo (http://groups.yahoo.com/group/QCUIAG) and soon discovered his amazing website "The Firmament" (http://www.thefirmament.nl) documenting all his efforts in the astronomy field. We met at the two QCUIAG conferences in 2004 and 2006, when he travelled from his native Netherlands to England to meet his fellow astro-imagers. Jan was a huge inspiration. From humble beginnings (astronomy-wise) imaging the moon and planets with a webcam and relatively cheap TAL telescope, he progressed, making many pieces of equipment himself - using such things as drawer handles, plumbing tubes, and pieces of metal and nuts and bolts from the local D.I.Y store, through to deep-sky pictures using a modified camera and a Meade LX200 scope, then more recently extremely impressive hydrogen-alpha solar imaging, frequently accompanied by a favourable comparison with the corresponding image from NASA's SOHO probe (http://sohowww.nascom.nasa.gov). Jan was always helpful and frequently offered advice about pictures I shared, even when not asked! When advice was sought on the various internet groups, Jan was usually there with a pointer to a relevant page on his site, which contains an extensive set of tutorials and highly detailed descriptions of everything from his home-made focus aids, SLR lens clamps, and dew heater, accessories he bought and made, software he used, "outreach" to his local community and so-called "special conjunctions", that is, meetings with fellow astronomers, and even the local weather and current universal time. Of course in addition to all of this, "The Firmament" contains practically every astro-image that Jan ever made, up to his last solar image in November 2011. Each in his standard form, carefully catalogued, with description and details of when it was captured, and how. It was shocking news when Jan revealed his diagnosis with cancer in August 2010 but in characteristic fashion he didn't immediately retreat or withdraw but instead documented his progress and treatment on a new "My Health" page, at one stage admitting he had revealed perhaps too much detail. Optimistic to the end, at least to outside observers, Jan commented on 16 December 2011 that he was unable to reply to emails but welcomed receiving them, and maintained his Christian faith that perhaps helped him keep going so strong, longer than the doctors originally suggested.